Federal authorities have arrested a 56-year-old Florida man in connection with a series of so-called “mail bombs” he allegedly sent to notable Democrats and critics of the Trump administration. Authorities had Cesar Sayoc Jr. in custody three days after the first devices were discovered. Two more were found Friday as federal agents moved in on Sayoc, who has been arrested in the past on unspecified charges. Two more packages containing explosive devices were discovered Friday, one in Florida addressed to Sen. Cory Booker and another in New York addressed to former U.S. Director of National Intelligence James Clapper, officials said. At the White House, POTUS Donald Trump praised law enforcement officials for their quick investigative work and actions, while also condemning the suspect and political violence in general. Photos of a white van reportedly owned by Sayoc show that its windows are covered with pro-Trump, anti-Leftist decals. Pipe bomb devices – again, none of them detonated and most of them were very amateurish in nature and likely would not have gone off – were found/sent to the offices of CNN in New York City; George Soros’ home in Katonah, N.Y; the home of Bill and Hillary Clinton in Chappaqua, N.Y.; former CIA Director John Brennan in Manhattan, N.Y.; Robert De Niro in Manhattan; former Director of National Intelligence James Clapper in Manhattan; former President Obama’s office in Washington; D.C.; Rep. Maxine Waters’ D.C. and California offices; and former Vice President Joe Biden’s home in Vermont. 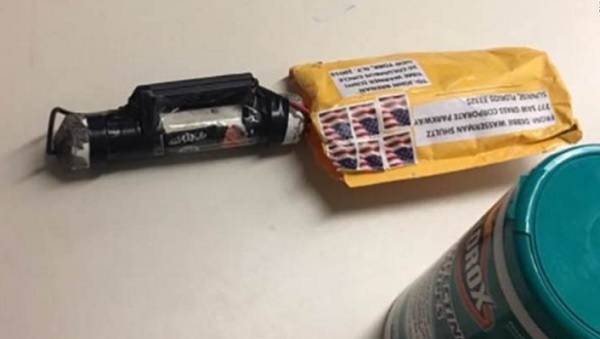 Packages were addressed to, but never reached, Sen. Cory Booker, D-N.J., and former Obama Attorney General Eric Holder. “I think anyone who has in any way been a critic, publicly been a critic of President Trump needs to be on extra alert and take some cautions, precautions, particularly with respect to mail,” he said. Mind you, Clapper and the others who were ‘targeted’ by these fake devices have not once spoken out against Democrats – like Waters, Booker, and Hillary Clinton – who have been dog-whistling to their supporters to commit acts of violence against Republicans and Trump administration officials by “getting in their faces,” telling them “they’re not wanted here,” and by refusing to be “civil” to them. For a time, there was some Democratic condemnation of the Left-wing Bernie Sanders-supporting lunatic who tried to assassinate House Majority Whip Steve Scalise, R-La., in the summer of 2017 and other GOP lawmakers as they practiced softball on a northern Virginia ball field early one June morning. There will be more information coming throughout today and for the next several days, so we’re going to learn much more about Sayoc and his motivations. But suffice to say the political rancor in our country is getting dangerously close to open warfare. And no one should want that. Read more about the trend towards domestic terrorism in America at Terrorism.news.